Sometimes there is clarity. Like when the Koch brothers-funded report on US health care came up with the ‘wrong’ conclusion – that is the right conclusion – $US2 trillion dollars worth of right conclusion. And like when a hard-core German economist breaks ranks and lays out the case for scrapping the Eurozone. Clarity. In the past week there have been some notable contributions to the debate about the viability of the Eurozone. Two German academics, coming from opposite directions, basically reach the same conclusion – the EMU is dysfunctional and prone to crisis and poor outcomes. And then in the same week, a third German, an economist basically breaks ranks with the Europhile reform lobby (neoliberal though it is) and sets out in fairly clear terms how the distrust between Member States is so high that reforms will always be cheated on and the intent derailed. He opposes the creation of a federal fiscal capacity because weak nations would overstate the extent of recession to get more money. Further, more money would be forthcoming to these nations as a perverse ‘reward’ for failing to deregulate their labour markets. His arguments demonstrate without doubt why functional reforms will not be possible in the EMU. It is time (way past that) to dissolve the disastrous experiment in an orderly manner. By way of background, there was an Op Ed earlier this week (July 31, 2018) – Claus Offe: Time is running out for EMU reform, as divide between winners and losers grows – which recorded an interview by Italian political scientist Maurizio Ferrara with retired German sociologist Claus Offe. The monetary regime of the Euro under which 19 very diverse national economies within the EU now live and operate is plainly dysfunctional. It does not serve its alleged and promised purpose of convergence but does the exact opposite. It is economically and politically divisive: Some participants win, others lose and the gap becomes wider. He was scathing about the reliance on internal devaluation within the Eurozone Member States as the only strategy to adjust “competitiveness” – a race-to-the-bottom which has failed to achieve it own claimed outcomes. He cited Italy – “still 8 per cent below of what it was in 2008. Yet that does not seem to be enough to boost Italian unit costs of labor”. 1. No independent monetary policy for Member States. 2. “living conditions of ordinary people have been severely depressed”. 3. Low interest rates have allowed Germany to enjoy low interest-servicing on public debt – the “winners” are advantaged. 4. The single currency “works as an export subsidy … Absent the Euro, the new Deutschmark would dramatically appreciate its exchange rate with the outside world and German export industries would largely collapse as a consequence”. He agreed that the “institutional reforms introduced in the early 2010s – such as the Fiscal Compact, the strengthening of supranational controls and conditionality, the adoption of democratic “monsters” such as reverse qualified majority rule for macro-economic and fiscal decisions – have severely aggravated EMU’s dysfunctionality”. Germany has in fact largely abdicated its responsibility in and for Europe. The German government’s obsession with rules, austerity and conditionality has been the main driving force behind the growing divergence of EMU economies and the devastating social shocks which has hit Southern member states. Germany thinks that if every Member State followed its example then they could become powerhouses. … the eurozone as a whole cannot become more like Germany. Germany could only be like Germany because the others countries were not. Insisting on ordoliberal convergence is guaranteed to produce economic instability, not stability. The discussion also examined the issue of responsibility – Brussels or Member States. It was noted that “the rhetoric of “saints” and “sinners” espoused by German leaders” has gone beyond all reason and that the “German framing of the problem of the EMU and the EU is often described and criticized as an obsession with ‘order'” which bans discretion at all levels. On the same day as that interview was published (July 31, 2018), the UK Guardian published an Op Ed from German economist Hans-Werner Sinn – Is this the end of the road for the euro? – who thinks the “single currency experiment has gone from party mood to hangover”. 1. Still sinning … a German economist who cannot face facts (October 23, 2014). 2. Rescue packages and iron boots (May 21, 2010). He opposed any rescue packages being extended to Greece because the Germans would become liable for the debts of other Member States, which is strictly banned under Lisbon agreement (which defines the EMU rules). His latest offering reveals little change in his views. Today, some of these countries, foremost Greece, interpret their membership in the European monetary union as having the right to pay for their imports with bonds rather than real resources. They are neither willing to offer investors higher yields, nor to render themselves somewhat cheaper, and thus more competitive …. they now demand contingency loans from other euro state, which the market is not ready to grant them … In the end, instead of doing something to reciprocate for all their imported smartphones, airplanes, and cars, they want to receive part of these goods as some sort of donation. If we take out the racist element that underpins a major part of the within-EMU debate at present (and the second world war hostilities that continue), then what we are left with is a massive denial of the reality of the situation. In part, the credit that flowed to the Southern States came from Germany, which through its own austerity in 2004 (Hartz Reforms), led to a lack of investment opportunities in that nation. And if the credit had not have flowed, German export surpluses might not have happened and then where would they have been without them. The southern Europeans’ response was to start printing what they could no longer borrow. This “printing” came in the form of ECB monetary policy which under the various forms (including the ‘outright monetary transactions” program) effectively funded the fiscal deficits of the Member States (except Greece). But those policies came with stifling and destructive ‘conditionality’ courtesy of the German obsession with rules. Amazingly, Sinn thinks that “Portugal, Spain and Greece are all governed by radical socialists who have abandoned the concept of fiscal responsibility, which they call ‘austerity policy'”. The fact that Spain’s fiscal deficit has exceeded the SGP threshold (3 per cent) came under the conservative PP government who were facing electoral oblivion in 2016. Brussels turned a blind eye to the ‘infraction’ because they knew that Spain would start growing again with the rising deficit and this would turn the political struggle in PP’s favour. As to Greece – Syriza is neoliberal central. They opted to keep power and implement a worse austerity program than their conservative predecessors. And finally, he once again expresses a vehement opposition to “more debt socialisation and risk sharing at the European level” which would “cause severe economic damage”. The two contrasting positions – from Claus Offe and Hans-Werner Sinn – which lead to the same conclusion that the EMU is basically ‘cooked’ – illustrate why it was folly to introduce a common currency in the first place. But I thought it was the offering of a third German commentator this week (July 31, 2018) – Whither a fiscal capacity in EMU – by academic economist Lars Feld that was the most telling. As Feld explained, he was originally part of the group of French and German economists (the so-called 7 + 7 Franco-German group) who earlier this year (January 17, 2018) published a proposal to ‘save’ the EMU from its flawed architecture – How to reconcile risk sharing and market discipline euro area. … the proposal for a fiscal capacity in European Monetary Union (EMU). I should add that the 7+7 proposals in this regard were all as deeply flawed as the many that have gone before them. Since 2011, Feld has been a member of the German Council of Economic Experts (GCEE), which prepares annual reports on the performance of the German economy as a sort of check and balance for the German government policies. He has long advocated some mutualisation of public debt within the EMU but with strict conditionality “provisions to keep moral hazard at bay”. He wrote that the GCEE advocated that position in 2011 and 2012 because it knew that without some change in that direction the “ECB would act”, which would lead to an “over-burdening of monetary policy in EMU”. He cites the Outright Monetary Transactions (OMT) program as that sort of response but has failed to “cope with legacy debt problems”. The GCEE approach would have so scorched the earth that debt ratios would have fallen to below 60 per cent in all Member States but with massive real costs – lost output, income and entrenched high unemployment. His issue is that as long as the Member States are carrying elevated public debt levels then there can be no real “market discipline” on fiscal policy in the EMU. Because nations would quickly become insolvent without the ECB liquidity support – conditionality or not. As I have written many times, the Eurozone has survived in its fraught form to date because the ECB has broken the laws and, effectively, funded fiscal deficits. It has done so in a totally destructive and perverse way – by adding the austerity conditionality to its support under the OMT program – but the on-going ECB funding of deficits saved the Member States from insolvency. Italy would have been insolvent and forced to leave the Eurozone in 2012 had the ECB not intervened and purchased massive volumes of its public debt in the secondary markets. The private bond market investors knew then that the risk of buying primary issue was minimal and they could get a handy profit by on-selling the debt to the ECB in the secondary market. That is clearly the reason the EMU remains intact today. Which brings us to Feld’s view on the “need for additional fiscal capacity”. He accepts that “additional fiscal space could be created by a European fiscal capacity”, given that the current arrangements prevent the Member States from having sufficient fiscal capacity “to cope with idiosyncratic shocks”. But he believes this issue exemplifies the “moral hazard problem of a fiscal capacity for the euro area”. To clarify, much of the to-ing and fro-ing about this issue reflects the basic distrust that exists between Member States, their polities and the technocrats. The moral hazard problem means in this context that Germans cannot trust Italians to play by the same rules that Germany does. It has always been thus in debates about European integration which began after the defeat of Germany in 1945. I examine that distrust in chapter and verse in my 2015 book – Eurozone Dystopia: Groupthink and Denial on a Grand Scale. It remains the reason the EMU can never work. The distrust is so high that the rules imposed to constrain Member State discretion lead to destructive outcomes, of the type Claus Offe referred to above. Originally, EMU counted on member states’ individual fiscal space to cope with economic shocks by expansionary fiscal policy. Arguing that in the status quo, some countries have accumulated excessive debt such that they are unable to provide fiscal impulses from national budgets reveals that the problem is insufficient consolidation of public finances in those states in the first place. It also indicates that the creation of a euro area fiscal capacity now would serve as a premium for countries with profligate fiscal policies in the past. 1. The assessment that the Member States could cope with shocks is wrong. 2. The convergence process leading up to Stage III of the Maastricht process was not stringent enough – prospective entrants to the EMU should have been forced to impose larger cuts to their fiscal deficits and reduce their public debt positions before being allowed to enter. 3. Instead, they were “profligate” – morality rules! 4. The creation of a federal fiscal capacity to save the Eurozone from itself would just reward that profligacy. Think back to 1998 and 1999 and ask yourself which nations would have satisfied Feld’s admissibility criteria. 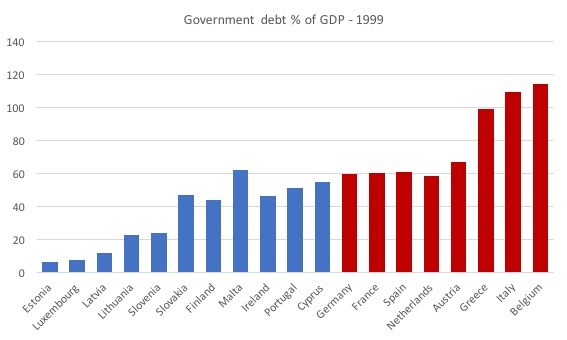 The following graph shows the public debt (as a percent of GDP) for the now 19 EMU Member States as at 1999. The red bars signify situations in breach of the SGP threshold rules (60 per cent) although Germany is on the cusp. Nations such as Austria, Italy, and Belgium – the core EU nations from the outset – would never have gone close to admission. Using the deficits criteria (3 per cent) several nations would not have made it in. I agree with Feld that the convergence process was a farce. I documented that in detail in my 2015 book – Eurozone Dystopia: Groupthink and Denial on a Grand Scale. The excessive deficit criterion was clearly tripping a number of nations up, including Germany. In 1997, France, Germany and Spain had deficits above 3 per cent and could not really appeal to the special circumstances clauses as a way out. As shown above, in relation to debt, Belgium was in a similar situation to Italy. Tactically, Germany could not isolate Italy without pleading some special case for Belgium, which of-course, it attempted without success. As 1997 dawned, it was clear that Germany itself might not meet the deficit and public debt thresholds laid out in the convergence criteria. German Finance Minister Theodore Waigel had the answer – his famous “I have never nailed myself on the cross of 3 percent. When I said in the past ’3 percent means 3 percent’ I did not necessarily mean 3.0 percent” – demonstrated the flexibility that the Germans would allow to themselves. There were accounting tricks, data fudges and fraud, watered down assessments, and massive hypocrisy demonstrated during this period. The problem was that the Member States were still going hell bent to meet the criteria even though economic circumstances militated against that achievement. The result: a period of extended austerity which caused unemployment rates to rise and remain at elevated levels. It was really a trial period for how to behave when a real crisis came and we saw that during the GFC! The point is that it would have been impossible for the Member States to bring down their public debt ratios to meet the rules within the convergence period. And trying would have made matters worse – the GFC would have come earlier. And many of the larger nations would never have joined. But the view that rejects any proposal to introduce a federal fiscal capacity at the European level because it rewards past bad behaviour is one that means that there is no prosperity possible in the monetary union. The distrust is too high to make meaningful reform. Lars Feld exemplifies this distrust. 1. Nations would lie about their “output gaps” – that is, claim the situation was worse than it is and thus draw larger federal payments. 2. Nations that had refused to deregulate their labour and product markets would have higher unemployment rates in a recession and be rewarded for it. This is the viewpoint that dominates European technocrats and is why the EMU is dysfunctional. They want Member States to impose even more neoliberal-inspired deregulation – take away job security, undercut pension systems, cut wages, cut income support schemes. They are in denial of the fact that if that level of deregulation was achieved then when a recession hit the poverty rates would soar above what they already have done. The introduction of a fiscal capacity would finally induce a basic constitutional shift. For the first time, a European institution would get the competence to conduct macroeconomic stabilisation, and thus possibly far-reaching fiscal competencies without the accompanying democratic and legal control. The earlier studies on integration (Werner, 1970; MacDougall, 1977) both insisted that a federal fiscal capacity should be a feature of any monetary union in Europe and that it must be embedded within the democratic process (European Parliament?). Merely handing over fiscal policy responsibilities to the technocrats in Brussels will not be sufficient in that regard. But, equally, imposing such stringent fiscal rules on Member States that have democratically-elected governments and threatening their nations with bankruptcy if they violate those rules (Greece 2015!) also undermines democracy. The EMU has chosen the second violation which Feld seems to support, which makes his ‘concern’ for a possible violation under the first option to be rather weak. The contribution of Lars Feld exemplifies why the EMU is and will remain dysfunctional. I agree that the problem is that there is no political union in Europe, which would serve as a unifying force. But to think that will ever be achieved is pie-in-the-sky sort of thinking. Without it, the distrust between the Member States – which economists dress up as “moral hazard” – is too deep. The cultural differences, the histories, the languages and all the rest that underpin that distrust means that there can be no meaningful and functional reform that delivers sustained prosperity. It is time to dissolve the disaster. The adoption of a considerably sized socialist state – back then just a decade ago – doesn’t count as special circumstance ? Amazing standards. Bill’s indictment is penetrating (ought to be agonisingly so, for any europhile with a social conscience), damning, but (IMO) fair and amply supported by the combined massive weight of the supporting evidence he presents. To my mind, the case is conclusively made and leaves no room for any conceivable *reasoned* counter-argument. But the response of a majority of besotted europhiles, self-described progressives as they mostly are, will nevertherless be (as exemplified at Bill’s Newcastle session the other day) simply to continue stopping their ears and praying that Bill (and others saying the same thing) will desist – because persisting is wounding to their feelings and (quelle horreur!) destructive of their precious self-image. The same phalanx of woodentops is very much in evidence in the strident arguments over Brexit, causing it to have become obvious that no accommodation is possible between them and any opposed body of opinion based on the proposition that it is as clear as daylight *in hindsight* that (for all the reasons Bill cites) the original vote in favour of joining the then-EEC was a terrible mistake, grounded in (wilful?) ignorance, which has been crying out to be reversed since Maastricht at the latest. That phalanx will seemingly go to any lengths in their efforts to subvert the outcome of the referendum whilst happily rationalising-away the affront to democracy entailed. It’s also piquant that the EU Commission’s approach to the negotiation of the terms for Britain’s exit is – as it was predestined to be – of a quintessentially technocratic and (when it suits them) selectively juridically-based character, when what is desperately needed (in regard to the Irish border problem, for example) is the exact antithesis of that: namely a political solution not a technocratic one. A profound culture-clash is at the root of the deadlock – the same culture-clash as was there (but which we blinded ourselves to) when a majority of us voted to join. De Gaulle (damn him!) was right all along. To say that there could *never* be a unifying force seems to me to be too strong. Some future external threat could serve as such. But, certainly, in the near future at least, such unity does seem to be rather unlikely. Meanwhile, the EMU could be dissolved. With Germany in the driving seat of the EMU machinations, I wouldn’t trust the system either. There are now rumors that Germany might work with May re Brexit behind everyone else’s back. This has been publicly disavowed. Whether that disavowal will satisfy those suspicious of Merkel, I could not say. And this [This is the viewpoint that dominates European technocrats and is why the EMU is dysfunctional.] part is so accurate. If after reading this article doubts would exist, please, look at this table [Verstöße gegen das 3%-Kriterium des Vertrages von Maastricht (seit 1999 bzw. seit Beitritts jahr) bis einschließlich 2015]. Search [EU-Staaten rissen Defizit-Kriterium in 165 Fällen] and click in the bottom of the page for the PDF. good at, they want all of society to be designed around those mechanics. Like some great artist thinking art should be at the center of organization of all civic life. Being good at getting money, saving money, subordinating and subjugating others to your goals and objectives, your ability form, develop, economic or business entities are only a part of life. They need to dismantle as quickly and benevolently as possible. They’r gonna leave behind a Europe worse off than when they started, filled with bitterness and distrust. The EU leadership think their EU model is so virtuous that it was inevitable that the EU’s membership would continue to expand and eventually include the East European nations as well. Putin quite reasonably concluded that Ukraine joining the EU and possibly also NATO was geopolitically too dangerous and economically disadvantageous for Russia hence became the trigger for Russia’s military intervention in Crimea and Eastern Ukraine. The world came close to having another major European war at this time and lucky Obama was US President at the time rather than the erratic Trump. Even now the vulnerable Baltic States believe a similar Russian intervention or re-incorporation of their nations is plausible. Military spending is on a steep upward trajectory. Wasn’t one of the main reasons for founding the EU to reduce the likelihood of another major European war? Is Russia not the largest European nation in terms of population and area? Why was the opportunity provided by Russia’s dissolution of the Soviet Union, the dissolution of the Warsaw Pact, of letting Eastern Europe’s nations determine their own paths and the substantial downsizing of Russia’s military capability, all squandered so that we are returning to a new cold war? The Eurozone should not only be abandoned to economically benefit its member states but the EU political union should also be abandoned and replaced with a European preferential trade zone with minimal central political authority. At some point such a model could reasonably include all of Europe’s nations and even adjoining Asian or Middle East nations including Russia, the CIS nations and Turkey once acceptable democratic and human rights standards are attained. NATO and Russian military independence could coexist with such a model for Europe and surely under such an arrangement military distrust and expenditure would reduce over time. Would be interesting to hear your comments about this new Wolfgang Munchau’s proposal for reforming the EMU. The propose is practically safe asset combined with euro zone’s balanced current account rule.